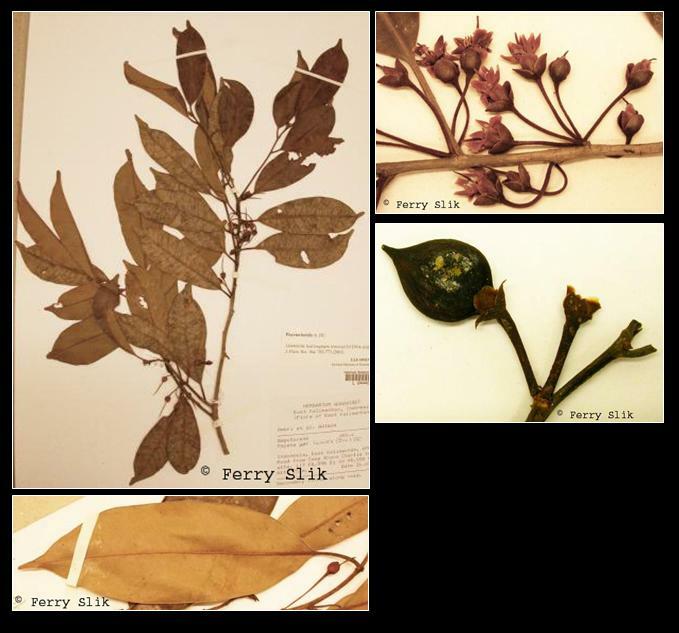 Specimens from Borneo might actually be Payena ferruginea. Payena polyandra (Wight) Benth. & Hook.f. Upper canopy tree up to 41 m tall and 65 cm dbh. Stem with white sap. Stipules ca. 2 mm long. Leaves alternate, simple, penni-veined, hairy undersurface. Flowers ca. 10 mm diameter, white, placed in axillary bundles. Fruits ca. 19 mm long, green, drupes. In undisturbed mixed dipterocarp forests up to 200 m altitude. On hillsides and ridges. In secondary forests usually present as a pre-disturbance remnant. The roots are used medicinally. The timber is used for house construction. The sap is used as 'gutta percha' (rubber). The fruits are edible. Burma, Thailand, Peninsular Malaysia, Sumatra, Borneo (Sarawak, Sabah, Central- and East-Kalimantan).